Aunt Polly catches Tom misbehaving, but finds it hard to punish her late sisters child. Tom's fight with a stranger in town causes him to temporarily lose his freedom. The reader is introduced to Tom's half brother Sid. Tom finds a way to turn a profit from his punishment. Tom tries to attract the attention of Becky Thatcher. Tom is wrongly accused and punished by Aunt Polly when Sid has an accident, causing him to evaluate his importance in the world. Tom trades his profits from the whitewashing for tickets in order to win a prize at church. Tom is introduced to Judge Thatcher. The church breaks out is a sudden commotion when a dog has a run in with a beetle. Tom attempts to stay home from school, with painful and unexpected results. While going to school Tom runs into his friend Huckleberry Finn. Tom is punished for being late to school resulting in him meeting Becky Thatcher. Tom and Becky's lunch together does not end well for Tom. Tom plays hooky from school feeling bad about his lunch with Becky. Tom runs into his friend Joe Harper. Tom and Huck witness a commotion in the graveyard. Tom and Huck run to town. Fearing for their lives they take an oath to never reveal what they have seen and promise behave from then on. News of Dr. Robinson's murder spreads throughout St. Petersberg. Both Tom and Huck are greatly troubled by the arrest of an innocent man. Becky Thatcher's illness causes a change in Tom's behavior, which leads Aunt Polly to believe he is ill. Tom continues to seek the attention of Becky. Tom, feeling low and friendless, decides that he would be better suited to a life of crime. The gang of Tom, Huck, and Joe plan to meet that night. The "Pirates" borrow a raft, intending to camp at a nearby island. The boys are alarmed at the news of a drowning. Tom, having returned home temporarily, overhears his Aunt Polly speaking with Mrs. Harper. Tom, Joe, and Huck continue to pursue their new life as pirates. A sudden and fierce storm causes the boys to reexamine their decisions. St. Petersburg prepares for a somber day. Tom, Huck, and Joe's sudden and unexpected arrival changes the mood of the congregation. Tom and Joe find they are now held in high regard by their peers. Becky, feeling rejected by Tom, attempts to make him jealous. Aunt Polly confronts Tom for his dishonesty after paying a visit to Mrs. Harper. Aunt Polly discovers Tom's note. Tom's attempt to reconcile with Becky do not go as planned. While at school, Tom catches Becky in the act. Becky is not as satisfied by Tom's punishment as she had hoped. Tom decides to take the blame for something he did not do, receiving adoration from Becky in return. While Mr. Dobbins plans for the school's final exam, the boys form a plan to get back at Mr. Dobbins. Tom continues to look for distractions. Tom finds himself suddenly ill.
With the start of Muff Potter's trial, Huck and Tom remember Muff's kindness. In court, the defense attorney calls forth a new witness. The real murderer makes an unexpected escape, while Muff finds himself embraced by the townspeople. With Injun Joe still on the loose, Tom continues to worry. The boys search for buried treasure leads them to a haunted house. The boys enter the haunted house and overhear a devious plan. Tom and Huck continue to search for treasure. Huck and Tom wait patiently for a chance to act. Becky returns from her vacation. Huck and Tom continue to hunt for treasure. Huck overhears a sinister plan for revenge. Huck seeks help in order to protect the Widow Douglas. Tom and Becky are discovered missing. Tom and Becky continue to explore. Tom and Becky are found and the cave is sealed off, presumably with Injun Joe inside. Injun Joe is finally found, causing Tom to feel a sense of relief. Tom and Huck return to the cave. Tom reveals a secret at Huck's surprise party. The disclosure of the buried treasure put the town in a frenzy. Huck and Tom find that there newfound wealth has changed their lives. Twain, Mark. The Adventures of Tom Sawyer. Lit2Go Edition. 1876. Web. 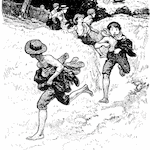 <https://etc.usf.edu/lit2go/34/the-adventures-of-tom-sawyer/>. April 20, 2019. Mark Twain, The Adventures of Tom Sawyer, Li2Go edition, (1876), accessed April 20, 2019, https://etc.usf.edu/lit2go/34/the-adventures-of-tom-sawyer/.